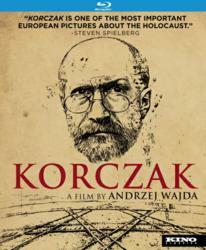 Kino Classics Releases Andrzej Wajda's film Korczak on Blu-ray and DVD. Kino Classics is proud to announce the Blu-ray and DVD release of Korczak, from Academy Award®-winning director Andrzej Wajda (Katyn), which Steven Spielberg called "one of the most important European pictures about the Holocaust." This acclaimed drama comes to Blu-ray and DVD from Kino Classics on August 14th. The SRP for the Blu-ray is $34.95, and the SRP for the DVD is $29.95. Both are currently available for prebook. This edition from Kino Classics also contains bonus materials, including the trailer and a stills gallery. Henryk Goldszmit had become a Polish icon in the 1930s through his writings, teachings, and radio programs for children, under the name of Janusz Korczak. When the kids from his Warsaw orphanage were to be deported to the gas chambers of Treblinka, he refused to abandon them, and with them he died in the Holocaust. Wajda brings this tragic tale to the screen in Korczak, starring Wojciech Pszoniak as the kind and fiercely committed doctor. After the Nazis invade Poland, the Jewish Korczak and his orphans are moved into the newly formed Ghettos, where he scrounges for food and vainly tries to protect the children from the violence and famine outside their walls. Korczak contains a powerful script by Agnieszka Holland (Europa Europa), stunning B&W cinematography by Robby Mueller (Dead Man), and is performed with self-immolating intensity by Pszoniak and the phenomenally talented ensemble of child actors.